Lavender is the plant that sells Provence. Without it we’d have to fall back on Sunflowers or Thyme but you can find them elsewhere, not like the huge expanses of lavender on the Valensole Plateau or the Plateau d’Albion. 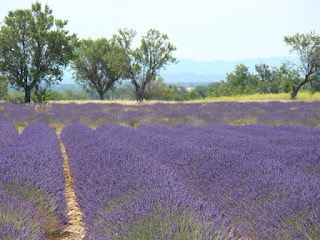 There is a problem however, lavender is in flower for only 4 weeks, although I have read on many a so called “expert in travel” to France websites that it flowers from the end of May to mid-August. The truth is : end of June to third week of July, no more, no less. 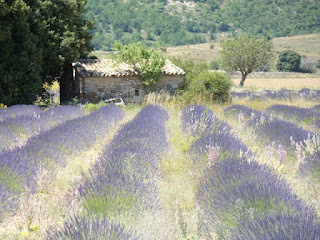 I have spent many an hour in meetings for the local end regional tourist boards debating on the best way to market Provence, and lavender crops up very quickly every time. It’s an easy sell and therefore should be used, but at the same time there is a strong movement against it, as there is so much more to Provence than lavender. For myself, I love it, and every year for four weeks it never ceases to amaze and enchant me, the different hues, the neat tidy (probably treated) fields, and the ones with about as many weeds growing as lavender plants and the vibrant green leaves of the wild almond trees growing at the ends or in the middle of the fields, witnesses to a not so distant past when almond orchards outnumbered lavender fields. 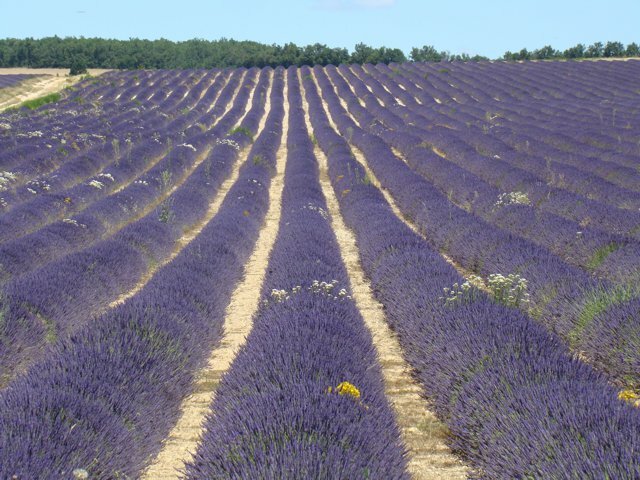 It wasn’t until the start of the 20th century that lavender was cultivated in fields. Up until then it was picked in the foothills of Provence by hand, but the growing demand from the perfume industry, and later the industrial sector for washing powders, shampoos etc. gave rise in about 1905 to the experimental planting of wild plants. It took many years to perfect the process and after experimenting with cross breeding and grafting with the strongest and most prolific plants, the first successful fields came to be around 1925-30. It was still picked by hand however, and even if taking on a row of lavender with a scythe is easier than picking individual stalks in the mountains, it was still a tough job in the July heat of Provence. In 1952 the first mechanical harvester saw the day, and things quickly changed. In 1920 the annual production of essential lavender oil was 70 tonnes 90% of which was wild lavender and 10% cultivated. By 1959 the annual production was 130 tonnes but this time 90% was cultivated and only 10% wild. 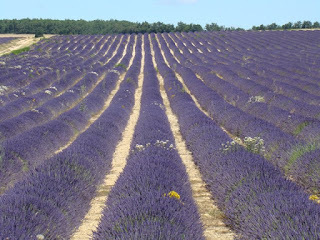 The lavender production moved to areas easy to harvest and they are still there today, mostly on the Valensole Plateau, and on the Plateau d’Albion . 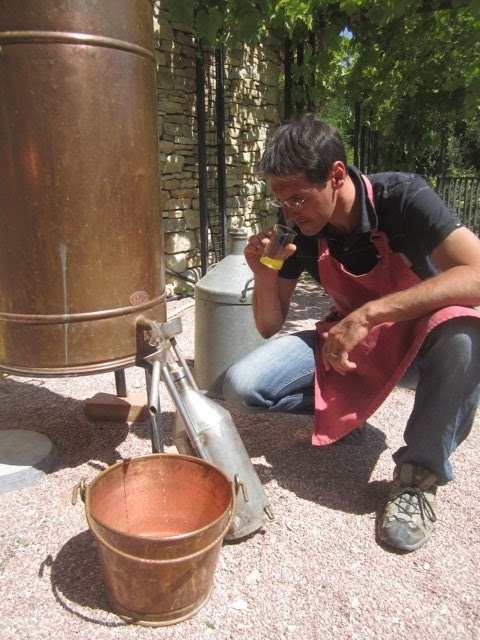 Today the production is all cultivated and the annual production is 800 – 1000 tonnes of essential lavender oil. The main production today is Lavandin whose essential oils are used in industrial products and the main production comes from the Valensole Plateau. 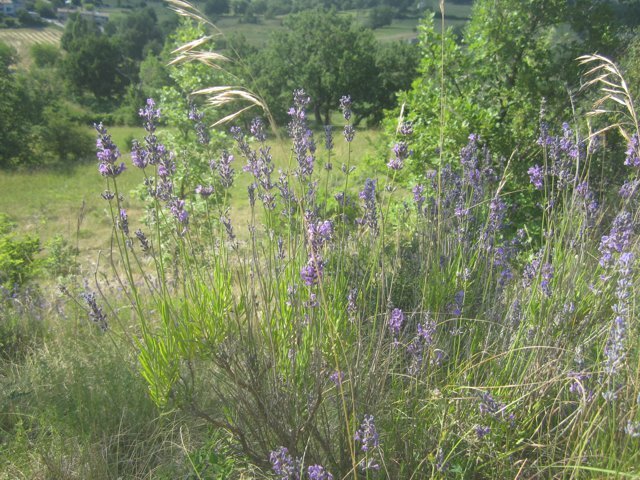 To find fields of True Lavender (Lavandula angustifolia) used in cosmetics and herbal remedies you have to climb above 800 metres to the Plateau d’Albion around the villages of Revest du Bion and Sault. 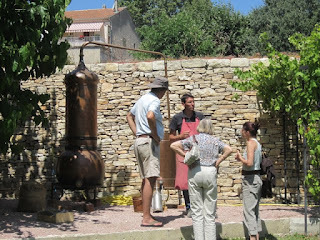 Alternatively you can still find True Lavender growing wild on the hills of La Haute Provence, and I wanted to put together a simple, interesting travel experience that would take you back in time, and allow you to experience a day in the life of the Provençal Lavender Pickers, with a few modern comforts thrown in of course, this travel experience will soon be available on the Unique Provence web site for the 2013 lavender season. 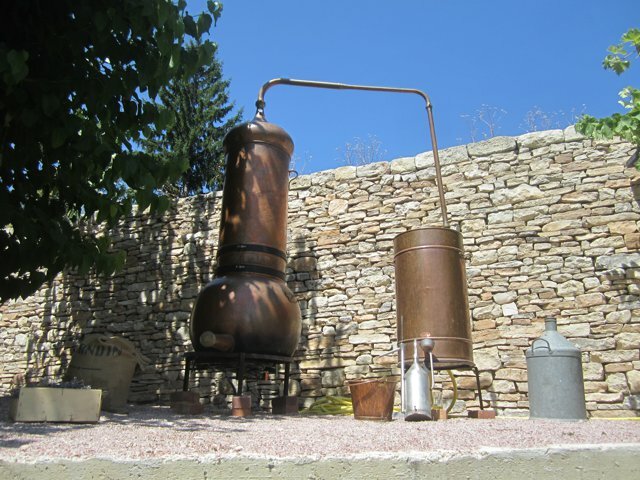 One of the components of the above travel experience is experiencing the lavender distillation up close, for this we have secured access to a marvellous still which we have been testing this summer. 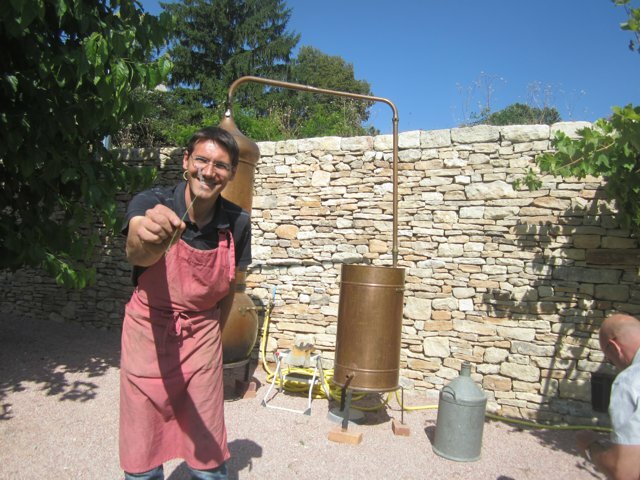 The still is supplied by the European University of Scents and Flavours, and our master of ceremonies in the photos is Olivier Bagarri, the director of the afore mentioned place of learning and a personal friend. 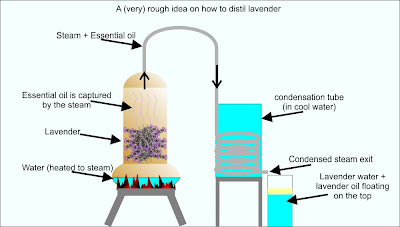 The process is simple water is heated in the bottom of the still, the steam rises and passes through the lavender capturing the essential oil, it rises out of the top, and condenses in the condensing coil where it comes out as lavender water and oil mixed together. 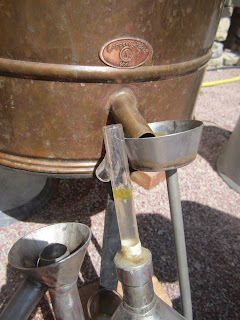 The oil rises to the top of the water and is recuperated. The lavender water is also kept and can be used in the house as it is very rich in lavender oil. Below you can admire my stunningly detailed diagram on how it all works! The amount of essential oil produced during a distillation is not huge, especially using lavande fine (True Lavender) which was the case in our experiments. The ratio of weight of lavender to weight of essential oil produced is 0.5% and with Lavandin it is 1.0% to 1.8%, so you if you join us next year you will be taking home a very small amount, but this experience isn’t about producing gallons of oil but about the way it is made. Here are some more photos of lavender distillation, with a little anecdote at the bottom. Lovely flowers!I don't like the attitude of that lady that she only grab the essential oil from you and went away without even saying thank you. Philip Haslett. Picture Window theme. Powered by Blogger.